Some poor folks have to wait years for an Android update to hit their devices, but owners of Google's Nexus phones and tablets have now been gifted two in a week. 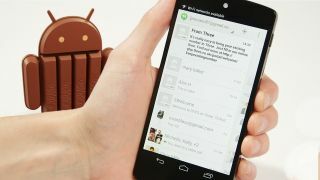 Just days after the Android 4.4.1 update landed on the company's own-branded phones, version 4.4.2 of KitKat is reportedly showing up on devices like the Nexus 5 and Nexus 7. However, all is not as it seems. Judging by early reports, it appears that the 4.4.2 update is a replacement for Android 4.4.1, which may not have been entirely stable. The change log for the update is identical to 4.4.1 in that it promises improvements to the Nexus 5 camera, with faster shooting, less motion blur and shutter lag, along with some general bug fixes. According to the official forums of US network Sprint, it appears that Google may have pulled the previous update, fixed some of the bugs and relaunched it under the moniker 4.4.2. So far, Android Police reports, the update is showing up on the Nexus 4, Nexus 5, Nexus 7, Nexus 10. Have you seen the update his your Nexus device yet? Have you spotted anything new? How's that camera working on the Nexus 5 now? Let us know your thoughts in the comments section below. Speaking of the Nexus 5, have you checked out our review of the handset?